Stonehenge is many things to many people: a historical riddle, a sacred space, or even a must-see tourist destination. But it’s also a cemetery, one where newly unearthed inhabitants tell a different version of British history. The newest findings from the site are reported in the latest issue of British Archaeology magazine. "In almost every depiction of Stonehenge by artists and TV re-enactors we see lots of men, a man in charge, and few or no women," archaeologist and British Archaeology editor Mike Pitts said in an interview with Discovery News. But Pitts says those depictions have got it all wrong. Pitts was co-director of a 2008 excavation of the chalk pit called Aubrey Hole 7, where team members recovered the remains of at least 14 high-powered women and nine men. Identifying the sexes and ages of the deceased was an especially complicated task. For one thing, they’d all been cremated. For another, this was not the first time some of these bones had been dug up. Earlier excavations as far back as the 1920s had found cremated remains at Aubrey Hole 7, but technology at the time was too limited to do much with them. The remains were rather unceremoniously tossed into sacks and eventually dumped out and reburied at the site, along with a lead plaque explaining the decision. It’s easy to tell these women were important, Pitts told Discovery News, because, well, look where they were buried. “Anyone buried at Stonehenge is likely to have been special in some way: high status families, possessors of special skills or knowledge, ritual or political leaders." When Pitts’ team returned to Aubrey Hole 7, they had no idea what they’d find there, or if what they found would be usable. The authors write in the British Archaeology article that they knew there was a chance that they’d lift the turf and find nothing but powder. They didn’t find powder, but they did find a mess. 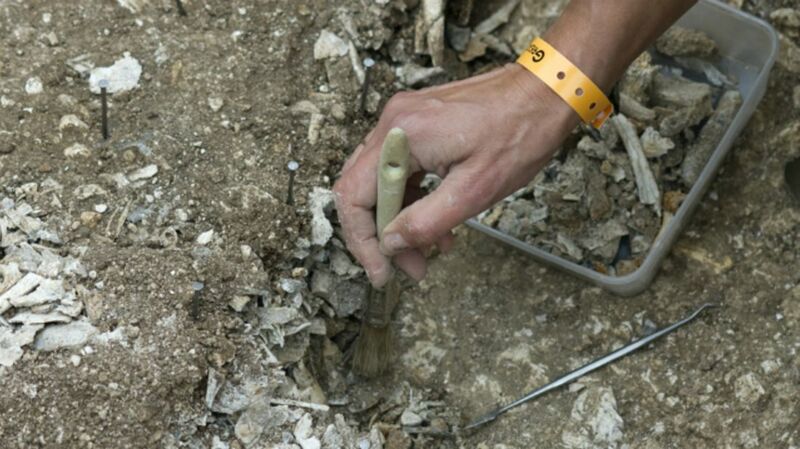 Everyone’s bone fragments were scattered and mixed together, like a pile of very old LEGOs. The team pulled up 45 kilograms, or 99 pounds, of jumbled remains. The arduous task of analyzing those remains went to Christie Willis, a Ph.D. student at University College London’s Institute of Archaeology. Back in the lab, Willis picked through the remains, looking for recognizable bone fragments. Some human bones, like those in the skull, are hardier than others, and therefore make more reliable records of their owners. By looking for petrous bones (found near the ear canal) and occipital bones (found at the back of the head), Willis was able to identify the remains of 23 individuals. Computed tomography (CT) scans further identified 14 of those individuals as women. "The archaeology now shows that as far as the burials go, women were as prominent there as men,” Pitts told Discovery News. “This contrasts with the earlier burial mounds, where men seem to be more prominent." The article’s authors note that the inhabitants of Aubrey Hole 7 seem to have lived relatively decent lives. Very few bones showed signs of violence or trauma, and most of the deceased seem to have died of old age. An additional report on the findings is forthcoming in the journal Antiquity, and Willis intends to incorporate her analysis of the remains into her thesis. All images are courtesy of Mike Pitts.